Today's planning spread looks completely normal for me. Today is Sunday the 19th, and the planner really hasn't been updated since Friday. It's messy and crazy and scattered. But it has not been neglected. I had a long weekend, bringing my kids to a sitter, traveling all day Saturday to a meeting, and going to church this morning. I certainly used my calendar and my task list, but I didn't have time to stop and think or make a daily list. I made notes at the meeting and follow up lists for Monday morning. I kept track of my calories. I added to my grocery list (especially after The Great Coffee Panic of 2014...no worries, the coffee was in the freezer). I did the must dos. My planner may look disordered and abandoned this weekend, but it's not. 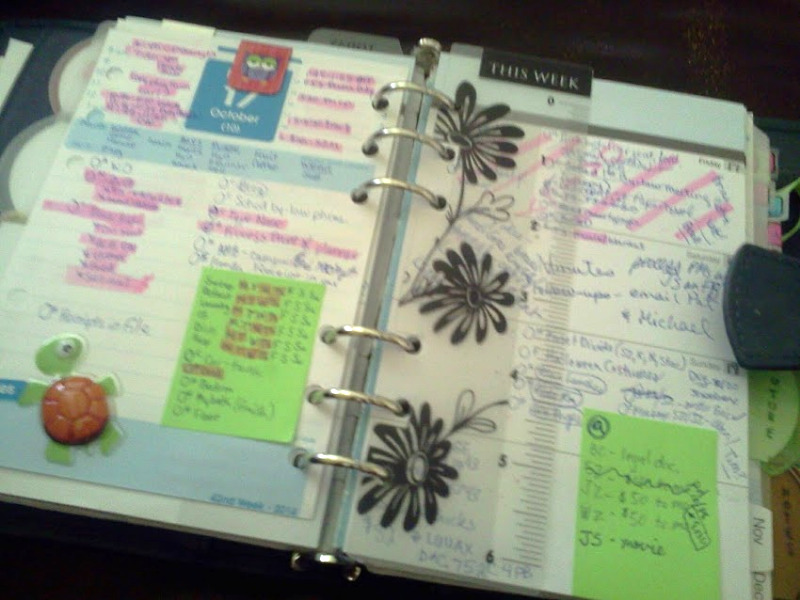 That is what a work horse planner looks like! *Things that still need to be taken care of (done, deleted, delegated, or delayed) are unhighlighted and therefore easy to see. Unhighlighted stuff starts on Friday's daily page (to the left) and on Saturday and Sunday's weekly squares. *Undone chores are noted for making a Sunday cleaning plan (on the green sticky on the left). Lots of chores were undone this week, just because we were out of town yesterday. TIP: A friend at the Giftie Etcetera Facebook Group suggested putting my chore sticker on a sticky note so I can move it from daily page to daily page. Brilliant! *Things borrowed are listed on the weekly spread (on the green sticky to the right). That means that when my sister paid me back for a gift that I bought on her behalf, I could just scratch through it. *Because Saturday was left blank on purpose, due to an all day meeting, I used that space to jot last minute notes. I am not advocating a messy planner like I have right at this moment. But, I am suggesting that you forgive yourself and accept your planner, however messy or disordered or crazy it happens to be, because it is a living, ever-changing tool, and that's okay. Now, time to complete these Sunday tasks and get my life ready for Monday.